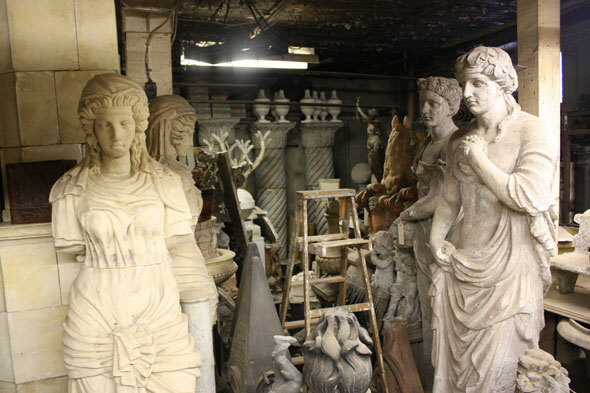 507 Antiques is one of those places you've seen a million times but never really looked at. Hiding beside the Don Valley expressway in a huge, clearly labeled building, it's strange how easy it is to miss. 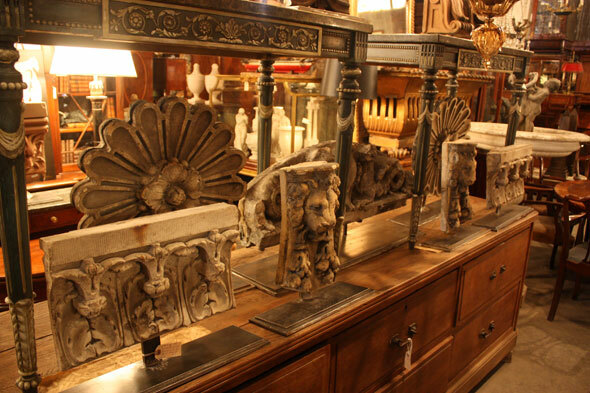 I've been in a few antique shops in my time and they usually fall into two categories: small, dingy and crammed with "as is" stuff, or on the other hand, the ones that are a little bit more high-end and with pieces that are polished, showcased and curated to entice you. 507 is neither and both of these at the same time. You get buzzed into a huge labyrinth, the walls of which are made of huge stacks of antique tables, armoires, side tables and chairs -- all of it lit by hundreds of chandeliers. In one corner, for example, a dozen 14 foot high armoires form a room around you. I feel like I'm on the set of some sort of Da Vinci Code / Alfred Hitchcock mashup movie. If a guy in a tux with a gun ran by, it wouldn't surprise me. The desks and tables are nice, but the truly astounding pieces are the architectural details that come from around the world. I love the mixture of styles and sheer volume of product. Why would I go to a store that might have one or two credenzas, when I can come here and see twenty. Actually, there are probably 20 more hidden away elsewhere in the building. 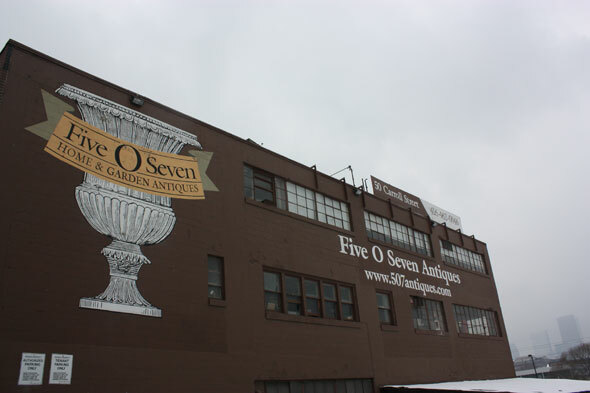 Given their stock, when thinking of going to 507, it's best to ask them to search their database for what you're looking for or make an appointment to view things in storage. The very personable manager, Kari, gave me a lesson in antiques -- 507 style. She patiently explained that the pieces on display would be "finished" if I purchased them. That means that any dings or scratches are fixed, surface refinishing is taken care of, and things like locks and keysets will be ensured to work. They are displayed "as is," but would in fact be in better condition when I took possession of them. While this was still sinking into my thick skull, she explained that the store wishes to create collectors, not just customers. To that end, if you desire, they will take a piece back from you and give you a credit towards a new piece -- even years after you bought it! Wow. She says many people make jokes about wishing marriage worked the same way. It goes without saying that none of this comes cheap, but, as with anything, you get what you pay for. It's hard to grasp that these pieces all had several owners before I considered buying them and will likely have several after their next purchase. I guess I'm so used to things lasting a few years (at best) that this concept is deeply unsettling, so I take a break and go f'coffee right nearby. But I'll be back soon. Writing and photography by Ian Milne.